Researchers from Spain discovered a way of using lead atoms and graphene to create a powerful magnetic field by the interaction of the electrons' spin with their orbital movement. The scientists believe that this discovery could come in handy for spintronics applications. 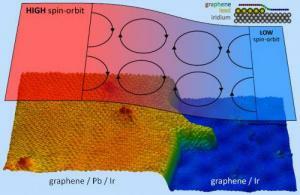 The researchers laid a layer of lead on a layer of graphene, grown over an iridium crystal. This way, the lead forms 'islands' below the graphene and the electrons of this 2D material behave as if in the presence of a huge 80-tesla magnetic field, which allows for the selective control of the flow of spins. The scientists also state that under these conditions certain electric states are immune to defects and impurities.